Brian Shott (brian.shott@gmail.com) is a historian and independent scholar. 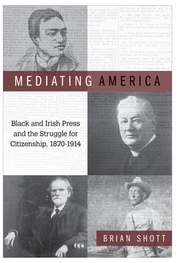 His book, Mediating America: Black and Irish Press and the Struggle for Citizenship, 1870-1914, is forthcoming in January from Temple University Press. 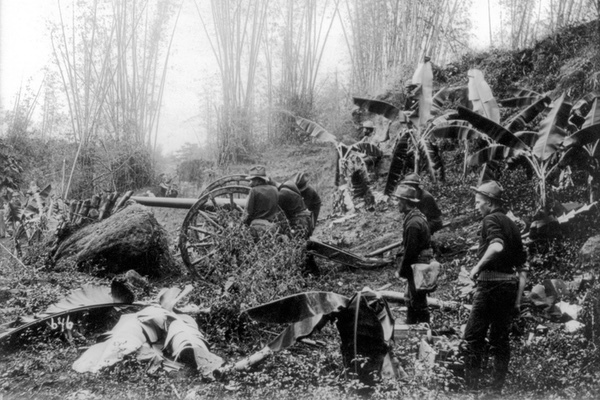 US soldiers in the Philippines, Manilla, during the Philippine-American war. The church bells have returned to Balangiga after 117 years abroad. They last tolled on Philippine soil on September 28, 1901, when the smallest of the three signaled the start of a surprise attack against U.S. troops by the town’s residents, angry at their mistreatment during U.S. occupation. The 48 U.S. soldiers killed in the assault—many of them clubbed or hacked to death in their barracks—comprised the worst single attack upon U.S. soldiers in the decades since Custer’s last stand at the Battle of Little Bighorn. U.S. retaliation—Brig. Gen. Jacob W. Smith told his men to turn the province of Samar into a “howling wilderness”—would lead to the deaths of thousands of Filipino civilians and become the most infamous campaign of the Philippine-American War. By bringing attention to this long-forgotten conflict, Balangiga’s bells challenge us to listen again for lessons from the past. But with attention spans shrinking and history itself becoming a battleground in the public sphere, can we accurately transcribe their messages? American soldiers took the bells as war booty during their revenge-fueled counterattack in Samar. Two bells wound up on a military base in Wyoming; the third found its way to a U.S. infantry museum in South Korea. Filipinos, who gained full independence in 1946 after three centuries as a Spanish colony and decades as a U.S. territory, have long sought their return. Observers even thought President Rodrigo Duterte, who mentioned the bells in patriotic speeches, might bring up the issue during his first meeting with President Trump in 2017 (he didn’t). But on December 14, years of public pressure and diplomatic negotiation finally brought the bells to St. Lawrence the Martyr Catholic Church in Eastern Samar. Americans don’t much recall the sounds of Balangiga. More patriotic strains ring in our collective memory. Our stories of these islands start later, in World War II, when invading Japanese forced haggard U.S. troops on a deadly march in Bataan—or when General Douglas T. MacArthur promised and completed his dramatic return (complete with a staged, shore-wading photo-op) a few years later. Yet even here, the leveling of Manila during its recapture—it became the most destroyed allied city in World War II after Warsaw—largely escapes American recollection. For Filipinos, by contrast, Balangiga’s bells seem to ring loud and clear—as a ballad to Filipino resistance and sovereignty. But despite Duterte’s use of Balangiga, Filipino popular memory still centers around Spanish colonization and mid-century, American-led liberation from Japanese occupation. The “tiny” war with America at the dawn of the 20th century, when more than 4,000 U.S. troops and up to 750,000 Filipinos lost their lives due to warfare, famine, and disease, is largely forgotten. And Filipino historians, like their American counterparts, still struggle to distinguish national myths and heroes from historical reality. We Americans needn’t go far to discover reverberations from Uncle Sam’s late-nineteenth century encounter with Asia—we could start with words. “Boondocks” comes from the Tagalog bundok, or mountain. U.S. soldiers passed down in speech racist monikers, too—historians believe “gook,” used by soldiers decades later in Indochina to refer to the Vietnamese, may have begun as “gugu” or “goo-goo” in the Philippines, American slang for their wartime adversaries (white soldiers also called Filipinos the n-word). Other premonitions of modern U.S. wars in Asia or the Middle East haunt these early years of American overseas expansion. The black press, for example, was split over sending African American soldiers abroad. “A man who is not good enough to vote for a government,” theRichmond Planeteditorialized in 1898, referring to black disenfranchisement, “is not good enough to fight for it.” Muhammad Ali’s refusal during the Vietnam War to answer the draft echoed this longtime African American stance. Photos from the early 1900s show U.S. troops applying the “water cure” to captured Filipino fighters—a kind of waterboarding without the board. And many U.S. generals in the conflict fought previously in the Indian wars of the western United States, demonstrating an even older provenance to American empire. Filipino and American historians have done much to uncover our two nations’ shared pasts. But in our efforts to counter jingoistic narratives of American nobility and Filipino haplessness, we U.S. historians, writing from an academy whose top history departments employ very few conservatives, may get trapped within different, uncontested viewpoints. We write critically about the white man’s burden, describing a turn-of-the-century push for colonies that was powered by racist fantasies, but often fail to notice white racism’s other, more isolationist impulses (the specter of non-white “others” coming to the mainland from U.S. colonies abroad may have partly stayed American expansion.) And our penchant for writing “history from below” can, at its worst, cast victims of U.S. aggression as pure and noble, when in fact Philippine society has long held its own brutal hierarchies. As my research into late-nineteenth century minority journalists in America led me, surprisingly, to the Philippines, it took some time before I encountered Balangiga in U.S. scholarship. Gen. Smith’s murderous Samar trek, by contrast, was widely cited with little or no mention of its direct antecedent. The Balangiga attack can never justify the Samar rampage. But its elision helps posit race hatred as the driving force for American aggression abroad, a common theme in much “race and empire” scholarship. Racism is integral to any discussion of imperialism. But listening to Balangiga might mean emphasizing the brutalizing effects of guerilla warfare upon any occupying army. Westerners are often shocked at the viciousness of Japanese troops during World War II compared to the relative restraint of the “greatest generation.” But we need only look at the more prolonged war in Vietnam—or at the brief turn-of-the-century war in the Philippines—to gain a sense of what young men from any culture are capable of, when sent to occupy lands where they’re unwanted. That’s my limited and, hopefully, humble attempt to hear some strains of wisdom sounding from three recently repatriated bells on the island of Samar. I hope more Americans and Filipinos, historians or not, will tune in, too.